Rummy is a series of card games played around the world with a typical 52-card deck, using cards ranking from Ace-low to King-high. There are some primary differences between basic, or straight, rummy and one of its followers: gin rummy. Learn the main points that separate these two games. Basic, or straight, rummy can be played with two to six players, and the number of deals or target score for winning must be agreed upon by the players before the game can begin. The dealer is picked randomly by the players, and the dealer responsibility rotates clockwise after each hand. Gin rummy, on the other hand, is played with between two to four players, Choosing the deal in gin rummy involves each player picking a card from a shuffled deck; the player that picks the lowest card is the one who deals first. Whoever has the lowest score after each hand is then given the dealer responsibility. In basic rummy, a player takes one card from either the top of the stock or discard pile, and adds it to his hand; he then can make a meld with three or more consecutive cards in one suit, or he can lay off a meld onto one made previously by another player. The turn is complete when the player gets rid of one card on top of the discard pile; if the player chose the top card from the discard pile to begin his turn, then he cannot put that card back down on the discard pile to complete the turn. In gin rummy, the first turn of the hand involves the first player choosing whether to take the first turned-up discard; if she chooses not to, the dealer can pick it up. If both the first player and the dealer choose not to take it, the first player must draw the top card from the stock. In basic rummy, face cards, or kings, queens and jacks, are worth 10 points apiece when melded; aces are worth 1 point; and number cards are worth their numeric value. For example; a 4 is worth 4 points. When a player is eliminated, the total value of all cards still left in each player's hands is added up, and the grand total is added to the winner's final score. In gin rummy, each player tallies up the total of his unmatched cards at the end. If the knocker did not go gin or had a count greater than that of his opponent, the knocker scores the difference plus a 10-point bonus. Players who go gin get an additional 20 points, plus each opponent's unmatched card values. Players also get 20 bonus points for each hand they win. In basic rummy, the game does not end until the target score is achieved, or the number of deals has been completed. Players make melds and lay off to win, with melds consisting of three or more consecutive cards in one suit, and lay off on other players' melds to get higher scores. 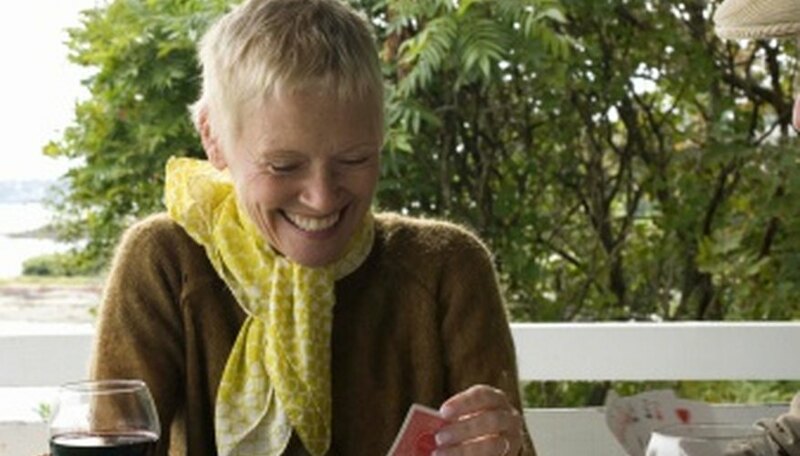 In gin rummy, one wants to knock, or lay down, all the cards in her hand as melds after discarding; if the remaining value of the cards that don't match, or deadwood, is 10 points or less, the knock is complete. Performing gin is knocking with no deadwood. The winner is the first to reach 100 points or more, with all aforementioned bonuses tallied after the winner gets to 100.